These days every business needs a web presence. A website is kind of mandatory if one wants to grow and flourish because more and more customers want to make online dealings. So, you must have a groovy online presence and to make sure your presence is pitch-perfect, we offer you an arsenal of professional website designers who work with utmost dedication to make your site a stunner. Our UI UX design services are well attuned with the latest technology and trends. We give appropriate attention to you as well as your customers so that your website looks and functions equally well. Our website design services revolved around the three Cs i.e. customization, creativity and competence. The idea is to fulfill you all your wishes and dreams while making sure your site looks distinct and operates with maximum efficiency. From HTML coding to the CSS presentation, every aspect is well taken care of and the results is always amazing. We believe you deserve nothing but the very best. We also know that you want the best website design company to design your site. 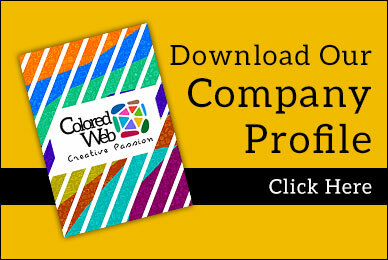 So, if you are looking for a reliable and competent web designing company, ColoredWeb is here to serve you. We give you professional website design as per your needs and requirements. We work as per your brief and bring our innovative streak in every project so that you stand out. And we are sure this is what you are looking at. So, give us a try. We are only one click away.